Programs of study are an important interface between student and institution. The program curriculum, as the architecture of learning experiences greatly influences the learning environment and the students' experience of the institution. Despite the recent institutional concern about program quality and significant investment in making positive change to teaching and learning, there is evidence of little change in curriculum design processes. Programs are frequently faced with challenges of criticisms, poor student experiences and opposing view points about what should and should not be done. 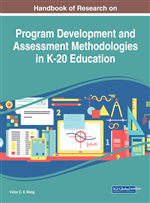 The present chapter develops a conceptualisation of the program level curriculum design process, with the intent of contributing to evolving approaches of program level curriculum design which meet the demands of the twenty first century. The conceptualisation of program level curriculum design presented in the chapter brings together key ideas from the literature including curriculum models, capacities for the twenty first century learners, activity theory and participatory design. Our universities attract over one million students, employ over 120,000 staff and directly contribute $24 billion to GDP. At around $16 billion each year, international education is Australia’s largest export earner after resources, and it builds vital links with the world. If we are to maintain our high standard of living, underpinned by a robust democracy and a civil and just society, we need an outstanding, internationally competitive higher education system. (Bradley, Noonan, Nugent, & Scales, 2008, p. ix). In general there is a shift towards ‘massification’ of higher education as a “necessity for the acquisition of life-long learning and life-wide learning opportunities” (Anchan, 2015, p. 9). The move is a positive step towards democratization of education (Anchan, 2015). To illustrate the shift towards higher levels of participation in higher education, across the globe, consider two examples: The Bradley report (Bradley, Nugent & Scales, 2008) in Australia clearly outlined an agenda for expansion of higher education recommending that 40% of 25-34 year olds hold a bachelor degree by 2025 and 20% of undergraduate enrolments are to come from low socioeconomic backgrounds by 2020. Similarly, the Ethiopian Government has initiated a move to make higher education more accessible to the broader population rather than only an elite few resulting in a large increase in student numbers (Goastellec, 2008) (Ministry of Education, 2015). Higher education institutions are striving not only to realise their economic and social value, but also to survive amid an environment of fierce competition, internationalisation and mounting economic pressures (Siemens & Matheos, 2010). Student recruitment, retention, and efficiency are consequently of great strategic importance for universities. The upshot of the situation is growing emphasis on the quality of teaching and learning (Tadesse, Mengistu, & Gorfu,, 2016), and in turn, a trend towards curriculum reform and renewal, including program level curriculum design. Program curriculum design warrants serious consideration. The program level curriculum provides the architecture of learning experiences for students during the entire course of their study. Furthermore, students may base their decision on which university to attend on the basis program selection and the perceptions of the quality of programs being offered. The program is therefore an important interface between student and institution and its quality is of paramount importance from an institutional point of view. However, despite the recognition of the importance of program curriculum and the implementation of policies and procedures to improve quality, there has been little impact at the ground level (Tadesse, Mengistu, & Gorfu, 2016) and there is thus need for further discussion and development. The present chapter develops a conceptualisation of program level curriculum design process, with the intent of contributing to evolving approaches of program level curriculum design which meet the demands of the twenty first century. As a backdrop to discussion, the term ‘curriculum’ is defined, some prominent curriculum models are considered. Importance is then placed on contextualising the program level curriculum. The notion of context is used as an anchor to develop a conceptualisation of program level curriculum design process which draws on activity theory and employs participatory design. Tools: In activity theory, tools mediate activity and conversely, also are changed by the activity. The tools can be anything – either physical or mental. Culture specific tools influence how people perceive things and act. Expansive Transformation: The individual or collective changes arising from a collision of activity systems and the contradictions which occur when elements of the systems are exchanged. “a full cycle ‘is the distance between the present day everyday actions of .... individuals and the historically new form of the societal activity that can be collectively generated as a solution to the double bind potential embedded in ... everyday actions’ ( Engeström, 1987 , p. 174 cited in Scott, 2016 ). Object: In activity theory, the thing being done is the object . The object encompasses the focus and purpose of the activity. Participatory Design: A collaborative, democratic, empowering approach to design processes that includes, on equal footing’ a range of stakeholders in the design process. The design is arrived at through discourse among the various stakeholders with stakeholders making genuine contribution to the final form of the design such that the design is owned by all. Program Level Curriculum: The purposeful, symbiotic organisation of learning experiences which enable both the development of discipline specific skills, knowledge, and attitudes, and the cultivation of lifelong learning capacity. Subject: As used in activity theory, the subject is the person doing the activity. The subjects’ motivations along with their intentions are brought to bear on the activity. Lifelong Learning Capacity: The capacity of individuals to continue acquiring new/ transforming knowledge and skills throughout their lifetime. Lifelong learning capacity requires critical thinking, problem solving, creativity and the ability to communicate and collaborate with others across cultures and across disciplines. Activity Theory: Activity theory, grounded in the 1920’s work of Lev Vygotsky and his student Leontiev (who is often credited as the founder of activity theory), brings to the fore that human activity, unlike the animal activity investigated by Pavlov is more than just stimulus and response. Rather, human activity is purposeful, consists of actions and involves the use of tools which mediate the activity (and vice versa). Activity, as understood in activity theory is a conscious action. System Thinking: A holistic approach focusing on how the component parts of a system inter-relate and affect each other.